If you find yourself in Thailand’s tourist hub Phuket, we’d recommend a visit to Patong beach … if we hated you. Every year squillions of tourists descend on the once glorious two-kilometre sandy expanse, and it shows: the beach is dirty, touts are relentless, the water’s plagued by jet skis, and if you aren’t careful a parasailer may just knock you out from above. Yes, you can endure this dystopian nightmare, or read on to get the skinny on some of Phuket’s secret beaches. Laem Singh: The steep walk down is worth it. So many people rocket by this beach as they make their way out of Patong it’s a crime. 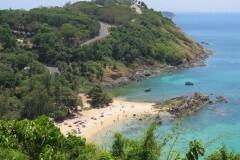 Head down the cliffside path and experience one of Phuket’s most beautiful beaches. The water is clean, clear and teeming with aquatic life. A large rock carves the beach in two, but can be walked or swam around. Umbrellas and mats are available to rent, and a few small restaurants – including the long-running Da Ali – still hang on here after the big Thai army beach vendor clearouts of 2014. Found between Kamala and Surin beaches, Laem Singh is easy to find with hand-painted signs set at the roadside, where parking is available. We didn’t find any bananas here, but there’s plenty of sand. A little further afield on the upper west coast after Bang Tao, Banana beach is well worth the trip. Using the nearby luxurious Trisara Resort as a way-point is a smart idea, as it’s a short drive north from there. Pull over when you see a short stretch of barbed wire fencing and you’ll find a short steep trail down to the water. Ample snorkelling opportunities and the scarcity of boat and jet-ski activity make this an ideal choice for laid-back beach connoisseurs. If you forget to pack a lunch, not to worry, the family who run the small restaurant shack here serve up a good range of food and drinks. Kalim: Just a short walk, yet a world away from Patong beach. While not exactly the most handsome beach in Phuket, Kalim has the advantage of being walking distance from Patong and completely vendor-free. Right at the north tip of Patong you’ll find a small strip of sand and water to call your own, with a rocky alcove providing fortification against the nearby army of sandy salespeople. A few mobile food stalls up on the little bridge behind Kalim will feed you. This forms part of the main road leading between Patong and Kamala beach, which means lots of noisy cars zipping by. This is a terrific place to get wet on a hot day, without having to negotiate a sea of tourists and touts to reach the water. Decent surfing here during the months of May through October, too. Ya Nui: Sun, sand and snorkels. One of our favourites. Nestled between Promthep Cape lookout and the long road back to Kata beach lies Ya Nui beach. It’s really two small beaches since the sand banks form two separate arcs split by a large rock formation. Many Thais fish and picnic here, though the restaurants across the road cater to the better-financed foreign crowd. The smaller of Ya Nui’s subdivisions looks innocuous, but will vacuum you out if you’re not careful. Keep an eye out for the loads of vibrant fish species but be careful to avoid the pointy rocks and barnacles. A couple of sharp rocky areas are on the primary arc of the beach too, so do a little underwater recon before splashing about. Kayaks, snorkel gear and a handful of umbrellas are available for rent. Really just a continuation of Mai Khao beach, this undeveloped beach just goes and goes and goes some more. 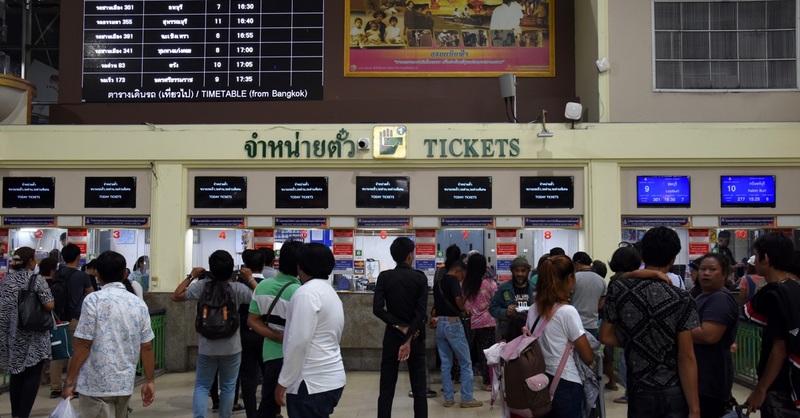 To reach Sai Keaw, you need to pass through the Phuket provincial check point first, so it really does feel world away from the hectic resort areas. Watch the waters during monsoon season as the currents can be treacherous and there are no life guards on this beach. While you’re in the area, do check out the mangroves on the other side of the bridge to the mainland. Sai Kaew’s looking even more deserted than before since the Thai army removed all its beachfront restaurants in 2014, but there are a usually a few mobile vendors selling snacks in the shade just back from the sands if you’re hungry. Failing that, head north to the old bridge where you’ll find several snack and fresh fruit stands. Think Phuket’s too crowded? Think again. Here’s Khao Kad beach. Found near the Panwa Beach Resort (formerly a Novotel) along the northwestern side of the Cape is a soft sandy beach offering sunset views across Ao Chalong. Though not ideal for swimming since at low tide it’s a mud flat, most come to enjoy the tranquility and the fresh seafood and cold drinks served up at the Beach Bar. If you turn up here in the morning, when the bar is closed, you’ll likely have the beach to yourself. A cheerful stretch of sand. Pleumsuk means ‘happiness’ in Thai. Another east-coast beach that has yet to welcome the tourist hordes is Pleumsuk beach on Ko Siray. Lined with a few excellent Thai seafood restaurants and not much else, with views out to Phang Nga Bay, Pleumsuk is a top spot to soak up some local atmosphere. Swimming is possible during high tide, though the water is a bit murky. Even the dogs are lazy at Laemka beach. Laemka beach on Phuket’s southern end is a tiny beach that sees far fewer visitors than the popular Rawai and Nai Harn beaches nearby. Laemka is not visible at all until you reach the end of the narrow lane leading to it off Viset Road, the main road linking Chalong to Rawai. With nothing here but a few vendors selling snacks and drinks, you could easily park yourself here for a whole lazy day. Ao Sane, beach bliss at the end of a secret road. Found down a narrow road that passes in front of The Nai Harn resort on Nai Harn’s western end, this small white-sand beach is a peaceful spot with decent snorkelling around the rocks just offshore. Ao Sane Bungalows offer beachfront dining and basic rooms for rent, and there’s a dive shop here, too. Baan Krating resort further down the road is a more swish place to stay. The rustic Hua beach is hidden away in a luxury enclave. On the west coast, just a few minutes south from the popular Kamala beach, is Hua beach, a small stretch of sand at the end of a narrow, tree-lined lane. Found along the road dubbed the “Millionaire’s Mile” because of the luxury resorts and villas in the area, it’s surprising that the land approaching Hua beach has not yet been bought up by a billionaire seeking a private hideaway. For now, happily, it’s a public beach with free parking and few visitors. At the southern end of the beach, catch a glimpse of the luxurious lifestyle with a peek into the edge of the Laemson villa estate. 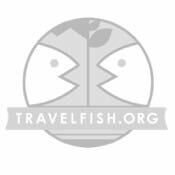 Or if you have a spare 50,000 baht in your backpack, go ahead and book a night’s stay there.